Trailhead/Access: Cabe Lands Access, Howe Street west of Sparger Road and Pleasant Green Access, Pleasant Green Road. 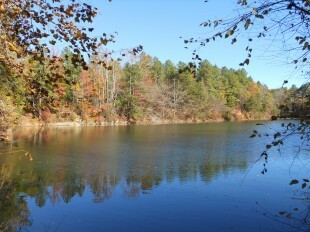 These access areas are part of Eno River State Park and have gate hours of 8 a.m. to sunset. There is no overnight parking. Parking on summer weekends can be tight. Click on map below for more detail. The biggest surprise on this trail is suddenly hiking into the inner sanctum of the Eno Quarry. After the quarry there’s a mellow drop through a flood plain before a mellow climb through a planted pine forest deposits you on a bluff overlooking the Eno. The trail passes through thickets of mountain laurel, tight passages that will put you in mind of your favorite mountain trails. Another flood plain, a passage under Pleasant Green Road and you’re at trail’s end, for now, at the Pleasant Green Access. Click on the link below the Google map to open it up in a larger version which includes definition of the map symbols, hiking notes, and an interactive option for driving to the trailheads. Note: state park boundaries are not accurate.